Ancient Egypt Research Associates is pleased to announce the release of Settlement and Cemetery at Giza: Papers from the 2010 AERA-ARCE Field School. This volume is the first in a series of planned volumes representing the culmination of student work prepared during our Analysis and Publication Field Schools, the final step in our four-part field school for Ministry of Antiquities Inspectors run in conjunction with the American Center for Research in Egypt since 2005. It is with great pride that we present this volume of our students’ work. In some cases, these papers are our students’ first print publication—a momentous achievement for any young scholar. Providing both training and a platform for publication helps our students become active participants in their country’s proud archaeological heritage, not only playing a role in safeguarding it but also in disseminating it to the world. We are proud to present their work and feel strongly that it contributes towards a further understanding of Old Kingdom and Late Period Giza. Thank you to all our members for helping to make this rewarding endeavor possible. 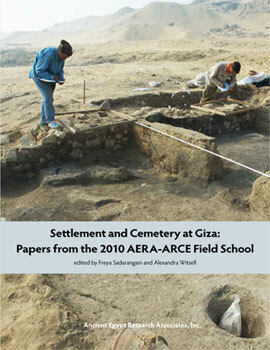 Click here to download a PDF copy of Settlement and Cemetery at Giza: Papers from the 2010 AERA-ARCE Field School.